Before we get started, let me introduce myself real quick! 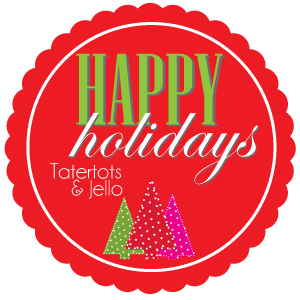 I’m Linda from Craftaholics Anonymous® and I LOVE holidays! Christmas can be such a busy time of year, so I love it when I find an easy, thoughtful neighbor gift idea. Do you need an easy idea for Neighbor Gifts this Christmas? This delicious drink mix is so yummy and fun to package for gift giving! This is one of my all time favorite hot drinks for the holidays. It tastes like egg nog…but a lot lighter on the calories! And it makes a wonderful gift. Everybody raves about the creamy, cinnamon flavor. This was our neighbor gift for last Christmas, but I never got around to posting it on my blog. So I’m excited that I could share it for this fun event on TT&J! I found those awesome wood scoops and white kraft paper bags online and knew they’d be perfect for my Cinnamon Milk Mix! Add in some festive washi tape and bakers twine, and you’re set! I used my Silhouette CAMEO and printable metallic foil to create the labels. Simply mix ingredients together and fill your jar or bag. To enjoy this yummy treat, mix 1/3 cup of mix with 8oz hot milk. I had a blast stopping by TT&J today! Thanks for having me over to play! Thanks Linda! That looks so yummy!! I’m a big fan of Craftaholics Anonymous! 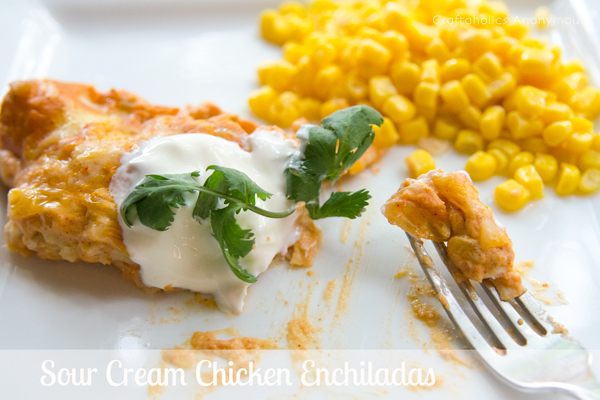 This Sour Cream Chicken Enchiladas Recipe looks so amazing. Talk about the ultimate comfort food! Yum! Just in time for Thanksgiving, grab this free Thankful Card Printable. Wouldn’t it be a great idea to give to someone you love telling them why you appreciate them? 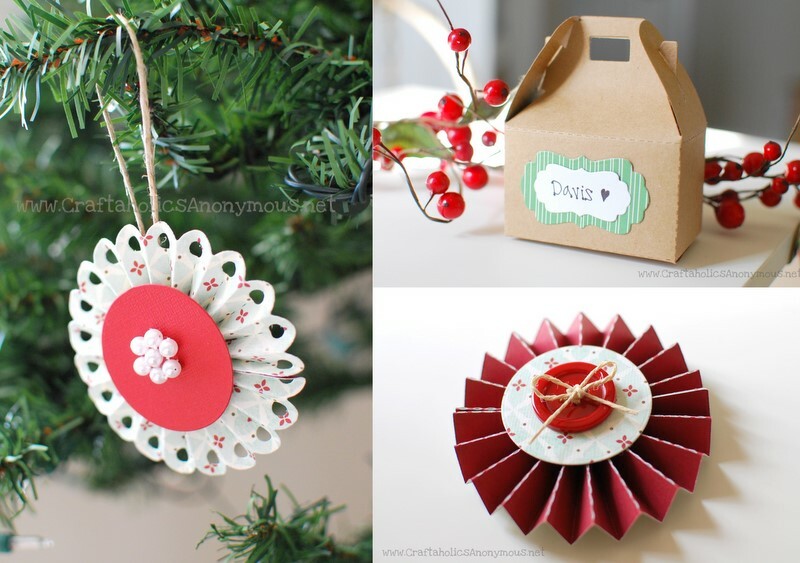 And, I think these Paper Lolli Ornaments are so sweet! And so easy to make! Where did you purchase your little wood scoops? Such cute ideas! 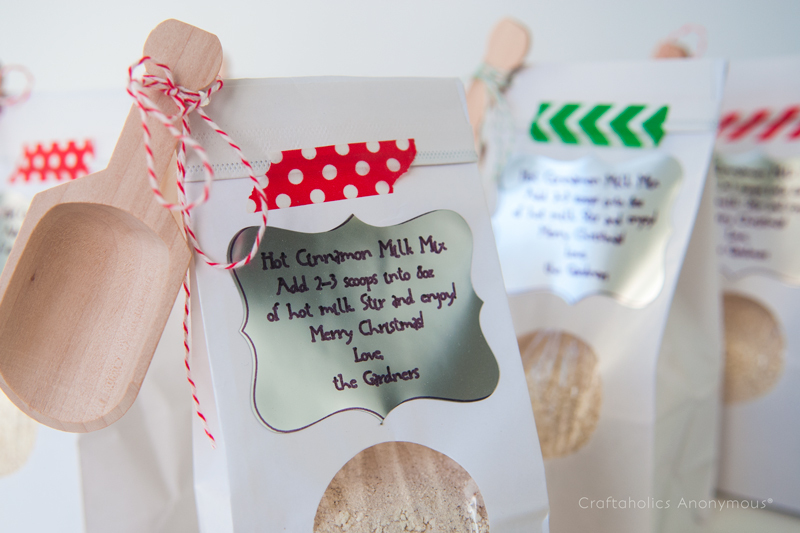 Love the hot chocolate idea…I think I will do this and add some mugs too. Thanks for the egg nog alternative! Also love the printable card. Now I just need to see if my home printer will be high enough quality. Ohh this is so cute. I loooove this idea. I would try this with my friends. Thanks for sharing this! Would you share your source for the wood scoops? This sounds like it’d be great in my morning coffee too! Great Idea!